Industrial workplaces such as garage workshops, metal fabrication and welding shops, and mechanical or heavy manufacturing facilities will have a variety of machines and tools. Some of the tools may be as simple as a table saw or box fan and sometimes they can be complex and partially robotic and involve hazardous chemicals. Workers responsible to operate, repair, clean, or just work near these machines and tools must be protected from potential hazards. Machine guards are critical to the safety of workers. Many times, workers do not realize the dangers that they are protected from because of a simple steel or acrylic guard. 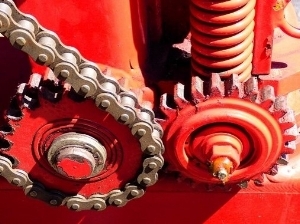 For this reason, workers should be familiar with the potential hazards introduced when machines with rotating parts, gears, or pulleys are used. OSHA Standard 1910.212(a)(1) Types of guarding. One or more methods of machine guarding shall be provided to protect the operator and other employees in the machine area from hazards such as those created by point of operation, ingoing nip points, rotating parts, flying chips and sparks. Recognizing the potential hazards of machines starts with understanding the first place where the potential for injury exists – this is the “point of operation.” According to OSHA the point of operation is the area on a machine where work is actually performed upon the material being processed. Workers have to be protected from point of operation hazards. OSHA Standard 1910.212(a)(3)(i) Point of operation is the area on a machine where work is actually performed upon the material being processed. Workers have to be protected from point of operation hazards, power transmission apparatus such as pulleys and chains, and other moving or rotating parts that pose danger to the operator. Workers should be familiar with the potential hazards introduced when machines with rotating parts, gears, or pulleys are used. OSHA Standard 1910.212(a)(3)(ii) The point of operation of machines whose operation exposes an employee to injury, shall be guarded. The guarding… shall be so designed and constructed as to prevent the operator from having any part of his body in the danger zone during the operating cycle. There are a variety of ways that workers could be protected from machine and point-of-operation hazards – some techniques require special training in order to ensure the safety of the operator. Fixed Guards – made of acrylic, metal, or even plastic that are bolted, welded, or locked in place provide stable protection from moving parts. Adjustable Guards – self-adjusting or manually adjustable guards that allow the material to be of multiple sizes or shapes but still protect the worker. Interlocked or Sensors – sometimes combined with adjustable or removable guards, interlocks or sensors can be set to instantly shut off power to a machine. Sensors may be designed to shut off a machine or tool as soon as a visible or invisible barrier is broken. Safety Trip Controls – similar to interlocks or sensors these devices can be in the form of metal bars, steel cables or wires, and floor mats or gates that are designed to trip and shut off power to a machine if a worker touches, steps, or enters a danger area. Restraints and Pullbacks – devices such as wrist straps and safety ropes attached to specific points to keep the worker from getting too close to a point of operation hazard. IMPORTANT: During the safety meeting or toolbox talk on Machine Guarding, it is important to emphasize that no one should ever tamper with or remove a machine guard, sensor or safety device. Only personnel that have received specific training and follow the correct procedures are authorized to remove, repair, or modify a machine guard. In addition, workers may need additional training in “Lockout/Tagout” procedures! More information on Machine Guarding can be found on OSHA's website at osha.gov and at the specific links provided below. Want this safety information in an easy to download file so you can share this with your team? Better yet, want it in a PowerPoint presentation format, with a pre-filled sign-in sheet and bonus information? You can get this safety information and so much more with a subscription to Weeklysafety.com. Weeklysafety.com gives you and your company access to hundreds of safety meeting topics and toolbox talks, safety resources you won't find anywhere else, safety topics professionally translated into Spanish, and so much more. This includes a safety meeting topic on Machine Guarding in both English & Spanish. Two versions are available with your membership including a 6-page Manager’s Presentation and a 2-page Foreman’s Topic. yes! i want this & hundreds of other safety meeting topics today!